This past Tuesday, three groups of students made class presentations on the three “supporting” plays we are reading in preparation for The Laramie Project. The plays — Our Town (1938), Execution of Justice (1986), Angels in America Part One: Millennium Approaches (1991) — represent a through-line of performance form and content that have direct connections to The Laramie Project. Students were asked to offer a short performance history and to tell the “story” of the play as well as trace its connection to Laramie in a way that reflected the storytelling approach of their scripts. We also asked them to read two supporting pieces of text: Brecht’s “Street Scene” (1938/1940) and Oskar Eustis’ introduction to Emily Mann’s Execution of Justice, written to accompany the play’s inclusion in the Political Stages anthology (2002). Our Town 2009 Barrow Street Theater production. Photo by Carol Rosegg from Playbill. Groups moved through their presentations in chronological fashion. Each of the Our Town students “narrated” their presentation a la the play’s Stage Manager. They described Wilder’s development of the text, the inspiration for Grover’s Corners emerging from time he spent in Peterborough, NH as an artist working at The MacDowell Colony. They talked about his Switzerland trysts with writer/academic Samuel Steward (who eulogized Wilder in a May 1980 issue of The Advocate) around the time he was composing the play and the writer’s block that was swept away when Wilder completed the whole of Act III in one night. Their condensed version of play’s story highlighted Wilder’s decision to reveal the theatrical frame that surrounds the play both through the character of the Stage Manager and the removal of “realistic” representations of the town’s settings (home, business, cemetery). Both plays display and deconstruct our notions regarding American small towns, but in Our Town there is greater emphasis on the town’s daily routine, the life-span of its families (youth-marriage-death), and the domestic world versus the attention the land/landscape receives in Laramie. Each play deals with a trauma, the death of a central character, but Laramie focuses on the response of the living to this death. Our Town turns its eye to the dead, their inexorable abandonment of earthly concerns, with a final admonishment to the living to savor the world around them before it is too late. As we noted in our discussion after the presentations, it is interesting to see Wilder’s use of devices (narration, breaking the 4th wall, representational vs. naturalistic setting, juxtaposition) mentioned or alluded to in Brecht’s “Street Scene,” written around the same historical time. Our director, Jeff Storer, also mentioned the radically different choices made by director David Cromer for a 2009 production of the play at the Barrow Street Theater. While Wilder’s choice to pantomime and suggest settings was a departure from the theater of his time, these conventions have actually become staid and dated in contemporary performances. Cromer shook up tradition by having his company play their scenes in and around the audience (doing away from the rather typical proscenium divide of stage and seating) and by staging the scene the dead Emily wishes to relive in Act III in painstaking, naturalistic detail. The kitchen was a precise replica and the audience was engulfed in multi-sensory experiences as audience members see, hear, and smell Mrs. Webb making breakfast for the family and Emily tries desperately to regain the feeling of being there only to realize that the dead can never go home again. Cromer’s choice brought us face-to-face with a question that we will debate, experiment with, and struggle over throughout this rehearsal process: how do we make the familiar strange in a new and productive way? “All Rise!” The Execution of Justice team staged a trial, charging that Emily Mann’s script had “unduly” influenced Laramie in both content and form. 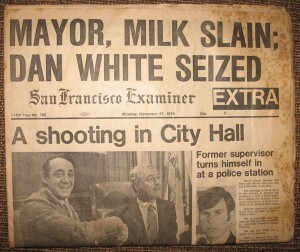 The majority of the “witnesses” reenacted scenes/moments from Mann’s script, particularly the dueling visions of Dan White presented by his defense attorney, Schmidt, and Norton, the San Fransisco District Attorney. In the class presentation, as in the Execution script, things boiled down to “closing arguments.” On one side, students argued that Execution‘s greatest influence on Laramie was in the area of content/subject matter. Like Laramie, the crime at the center of Execution‘s plot was very fresh when the play was being written. The facts of both crimes in both plays are not in question. 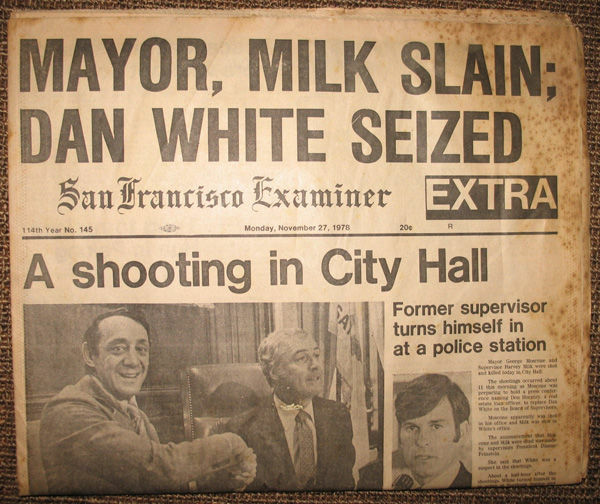 It’s not what happened on that fateful day in November 1978 that is up for debate, it is the why, the motivation, the mitigation offered for Dan White’s actions and the injustice of the verdict that comprise the bulk of trial. Both play’s have absent but central victims and though both plays are about communities in mourning the immediate families of the victims are largely removed from that mourning process. Both play’s construct a collective protagonist — the city of San Fransisco, the town of Laramie — and offer a platform for citizens to tell their version of events and, in the case of Execution, to examine how such a “clear cut” case of murder could return a verdict of voluntary manslaughter. Execution puts the trial on trial. It helps us see how one might admit guilt and be found not guilty. In this way it diverges from Laramie because in that play, although homophobia (in the form of a “gay panic” defense) is present, the guilty parties receive “appropriate” punishment for their crime, saved only by the compassion of the victim’s family. Students argued Execution also exerts notable formal influences on Laramie. Both texts dramatize the influence of outside “media” (exempting the theater itself, of course) on the course and presentation of events. The idea of trying a case in the press versus what evidence is allowed in court provides a significant strand of argument in Execution‘s Act II. Both plays present split-scenes and cross-cut dialogue among characters to juxtapose ideas. They also use an ensemble of actors playing multiple roles to frustrate any clear connection between performer and character. And both texts feature the staging of a trial, throwing the notion of “truth,” “reality,” and “perspective” on events into sharp relief, allowing both to comment upon the theatricality of our legal system as well as the very difficulty (impossibility) of ever knowing the truth of a case even as that case is officially adjudicated and a verdict rendered. To throw Carol Martin’s observation about “true” and “real” back into the mix here, it is interesting to note in Execution Mann is much more skeptical of American jurisprudence than Kaufman and the Tectonic company members. So while one play criticizes the “theater” of a jury trial, the other seems to find little problem with said theatricality, especially when it renders an “appropriate” verdict. Photo by John Gardiner of PRC's 2011 production of Angels in America. The group working with Tony Kushner’s Angels in America, Part One: Millennium Approaches had perhaps the most specific textual connection with Laramie. Angels is Laramie‘s theatrical touchstone. The play is referenced directly within the first 10 pages of the Laramie script as Jedidiah Schultz describes his parents’ refusal to watch him present a scene from Angels in a scholarship competition because he would be playing a gay man. Even reviewers mention Laramie and Angels in the same breath as both examine of gay life in America at the end of the millennium. Angels also provides Laramie a way to discuss AIDS in a profoundly different context in 1998 compared to the mid-1980s when Angel‘s action is set. The audience for Laramie learns about Matthew Shepard’s HIV+ status indirectly, through Reggie Fluty’s preventative treatment for possible infection after being exposed to his blood as she cut him down from the fence. And while Reggie describes the physical pain that comes with the AIDS drug regime, she ultimately proves to be HIV-. There is no discussion of how Shepard might have contracted HIV, nor is his sexual life explored in any detail, a key point of divergence between Laramie and Angels, which has been censored frequently because of its explicit depiction of sexual activity and the physical ravages of AIDS. This quartet of presenters sat at the four corners of a slightly off-center and asymmetrical square and intertwined the required elements of their research in ways that reflected the split scenes and juxtaposed dialogue dominant in Part One. They narrated character details in third person, in a move that both harkened back to Our Town and gave a sense of disorientation that marks Prior and Harper’s shared hallucinations. And they pointed out the distinction Kushner makes between including historical figures within his play (e.g. Roy Cohn) and heightening and imagining their private lives for dramatic purposes. Laramie presents the citizens of the western town with greater presumed felicity even as it explodes realistic conventions with choices such as narration, multi-role casting, representational vs. naturalistic staging, and a non-chronological plot ordered by thematic juxtaposition vs. strict cause-to-effect action. Add to these the fundamental dramaturgical concern of “Why are we doing this play now for this audience?” and the question of what it means to “saying it right … correct” as Father Roger demands widens exponentially. And, as we’ll see this week when we look at what more we know about Matthew Shepard, Laramie, the case and its representation/meaning in the 12 years since the event happened, there are no easy answers. 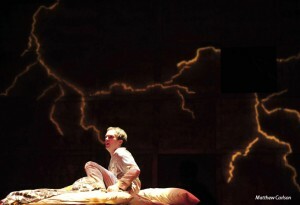 Dramaturg blog Angels in America, Bertolt Brecht, Deirdre Heddon, Emily Mann, Execution of Justice, Father Roger, MacDowell Colony, Oskar Eustis, Our Town. permalink. Jules, the questions you post at the end of this entry are, I think, very important and relevant to our (and every production) of a play such as Laramie. After watching the documentaries/films last night in class, one question really stuck with me. Why is it that a theatrical version of Laramie’s story considered more honest/less invasive than any media report? I agree that the Tectonic Theater Company’s performance might have been more honest because, unlike the media, they stayed in Laramie for weeks conducting interviews and getting ALL versions of “the truth.” So it’s fair to say that they understood the event better than reporters who spent 1 day in the town. However, what about high schools and small theaters that decide to put on the show–theaters and groups that don’t spend weeks on dramaturgical conversation and research (like our class is doing). What makes their performances more honest? I think it’s an important question to ask ourselves. How honest can we be in this production and how honest can we CLAIM to be. Jenny, your question is one I’ve struggled with for many years as someone who loves to work on documentary/ethnographic performances but is troubled by the resulting distance between the fieldwork that the original group/writer undertakes to create the original script and the way that script necessarily “stands in” for that fieldwork for the other groups who produce the text beyond the original. It reminds me of the question Jacob asked last night about whether Tectonic would ever release its notes, tapes, or transcripts. I’ve actually asked that same thing in a conference paper where I wondered what might have happened if they had published those notes (with the agreement of their informants, of course) and allowed other companies to make their own “Laramie Project” out of what they had collected. Or, what would have happened if they had not released a script at all but instead published set of working principles for folks to use to find/tell the stories of their own community’s “hate” crimes and the resulting response to those crimes. Now maybe such a scheme blows the whole rationale for theater production. 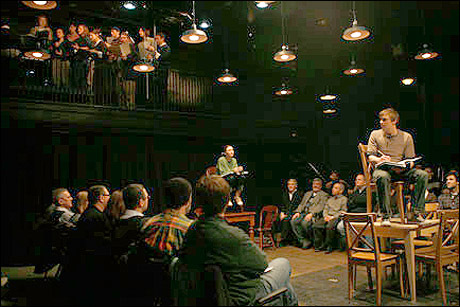 Certainly their title, “The Laramie Project,” and their appearance as actors on stage as equal informants (if largely in the background) as the Laramie citizens illustrates that the piece isn’t about getting to one, coherent truth about Shepard’s death but to show the process people went through trying to understand and come to grips with his death and how that event illuminated previously unspoken dynamics of the community. I’m eager to see how we can make the piece “our own”, in other words how/if it becomes a catalyst for a kind of “Duke Project” in which our presentation of the events chronicled in Laramie helps the campus ask relevant questions about our own community. I think it’s that kind of community connection that makes non-Tectonic performances of the play honest about their own contexts regarding violence, homophobia, mourning/memorialization, and activism not necessarily more honest about what happened to Matthew Shepard. Does that distinction make sense?